Microsoft Intune can help you to secure your managed computers with Endpoint Protection, which provides real-time protection against malware threats, keeps malware definitions up-to date, and automatically scans computers. Endpoint Protection also provides tools that help you to manage and monitor malware attacks. If you have not yet installed the Intune client on your computers, see Install the Windows PC client with Microsoft Intune. Use the information in the following sections to help you configure, deploy, and monitor Endpoint Protection. Use Microsoft Intune Endpoint Protection only if no third-party endpoint protection application is installed. Install Endpoint Protection even if a third-party endpoint protection application is installed = No If a third-party endpoint protection application is detected, Microsoft Intune Endpoint Protection is not installed, and is uninstalled if it was installed previously. Use Microsoft Intune Endpoint Protection, even if a third-party endpoint protection application is installed. - You want to switch to using Microsoft Intune Endpoint Protection. - You deploy a new client that will use Microsoft Intune Endpoint Protection. - You upgrade any client that will use Microsoft Intune Endpoint Protection. Use Intune without Microsoft Intune Endpoint Protection. Instead, you will rely on a third-party endpoint protection application. Install Endpoint Protection = No If you are not using a third-party endpoint protection application, this configuration is not recommended, because it could expose your organization’s computers to malware or other attacks. Microsoft Intune Endpoint Protection is not installed, and is uninstalled if it was installed previously. Leave your current endpoint protection application running while you deploy the Intune client software to those computers. Confirm that Microsoft Intune Endpoint Protection is installed and is helping to secure client computers. Using Intune software distribution to deploy a software removal tool that's provided by the manufacturer of the third-party endpoint protection application. For more information, see Deploy apps with Microsoft Intune. Removing the third-party endpoint protection application manually. Intune will not automatically uninstall third-party endpoint protection applications. Use the following steps to help you configure Endpoint Protection for Microsoft Intune. 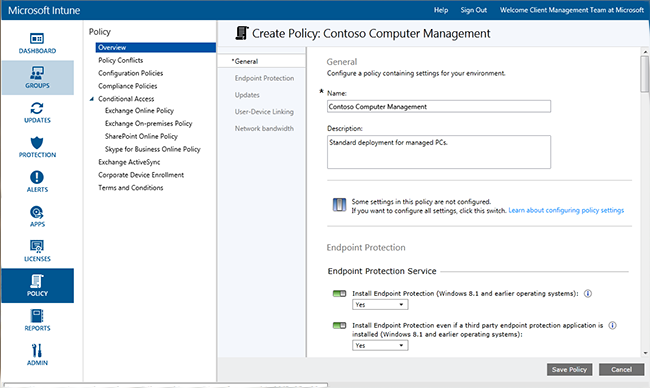 In the Microsoft Intune administration console, choose Policy > Add Policy. Expand Computer Management, and then select Microsoft Intune Agent Settings. Select Create and Deploy a Custom Policy to specify a policy for Endpoint Protection settings. Then choose the Create Policy button. You can use the recommended settings or customize the settings. If you need more information about how to create and deploy policies, see the topic Common Windows PC management tasks with the Microsoft Intune computer client. 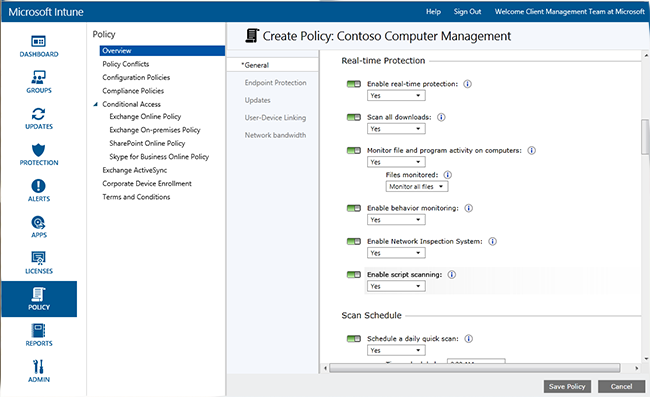 You can view the deployed Endpoint Protection policy on the All Policies page of the Policy workspace. Install Endpoint Protection Set to Yes to install Endpoint Protection on managed computers. If a third-party endpoint protection application is detected during installation, Endpoint Protection will not be installed unless the setting Install Endpoint Protection even if a third-party endpoint protection application is installed is set to Yes. Note: Intune Endpoint Protection is installed on managed computers by default. If you don’t want to install Endpoint Protection on your managed computers, you must explicitly set this policy to No. If Endpoint Protection was previously installed and the policy is updated to No, then the Endpoint Protection client will be uninstalled. Install Endpoint Protection even if a third-party endpoint protection application is installed Set to Yes to install Microsoft Intune Endpoint Protection even if a third-party endpoint protection application is detected. Enable Endpoint Protection Set to Yes to enable Microsoft Intune Endpoint Protection on computers that have the Endpoint Protection client. If set to No, and Microsoft Intune Endpoint Protection is installed, the Endpoint Protection client user interface is not displayed to users, and all protection features are inactive. Disable Client UI Set to Yes to hide the Microsoft Intune Endpoint Protection client user interface from users (requires a client computer restart to take effect). Install Endpoint Protection even if a third-party endpoint protection application is installed Set to Yes to force the installation of Microsoft Intune Endpoint Protection, even if a third-party endpoint protection application is detected. Create a system restore point before malware remediation Set to Yes to create a Windows System Restore Point before any malware remediation begins. Track resolved malware (days) Enables Endpoint Protection to track resolved malware for a specified time so that you can manually check previously infected computers. You can specify a value from 0 to 30 days. If you have set the policy values for the settings Install Endpoint Protection and Enable Endpoint Protection to Yes, and the policy value for Install Endpoint Protection even if a third-party endpoint protection application is installed to No, Microsoft Intune Endpoint Protection detects that another endpoint protection application is installed. This means that Endpoint Protection won't be installed, or will be uninstalled if it is already present. However, Microsoft Intune Endpoint Protection does report about the health of the other endpoint protection application in Intune. Microsoft Security Essentials alerts you with real-time protection when potential threats such as viruses and spyware are trying to install themselves or run on your PC. The moment this happens, you’ll see a message in the notification area to the right side of the taskbar. Enable real-time protection Enables monitoring and scanning of all files and applications that are accessed. It also blocks any malicious files and applications before they can run on computers. Scan all downloads Enables the scanning of all files and attachments that are downloaded from the Internet to computers. Monitor file and program activity on computers Enables the monitoring of incoming and outgoing files, and program activity on computers. With this setting, Endpoint Protection can monitor when files and programs start to run and alert you about any actions they perform or actions that are taken on them. Files monitored Enables you to choose if only incoming, only outgoing, or all files are monitored. Enable behavior monitoring Enables Microsoft Intune Endpoint Protection to check for certain patterns of suspicious activity on client computers. Enable Network Inspection System Enables Network Inspection System (NIS) on client computers. NIS uses signatures of known vulnerabilities from the Microsoft Malware Protection Center to help detect and block malicious network traffic. Schedule a daily quick scan Schedules a daily quick scan of both frequently used files and important system files on computers. This quick scan has a minimal effect on performance. Run a quick scan if you have missed two consecutive scans Configures Endpoint Protection to automatically run a quick scan on computers if they have missed two consecutive quick scans. Schedule a full scan Configures a full scan of all files and resources on the local computer hard disks. This scan can take time and can affect computer performance (the amount time it takes depends on the number of files and resources that are scanned). Run a full scan if you have missed two consecutive full scans Configures Endpoint Protection to automatically run a full scan on computers if they have missed two consecutive scans. Run a full scan after installation of Endpoint Protection Set to Yes to let Endpoint Protection automatically run a full system scan after it is installed on computers. This scan runs only when computers are idle to minimize the effect on user productivity. Automatically run a full scan when needed to follow up malware removal Set to Yes to let Endpoint Protection automatically run a full system scan on computers after the removal of malware to help confirm that other files were not affected. Start a scheduled scan only when the computer is idle Set to Yes to prevent scheduled scans from starting when computers are in use to prevent any loss of user productivity. Check for the latest malware definitions before starting a scan Set to Yes to let Endpoint Protection automatically check for the latest malware definitions before it starts a scan on computers. Scan archive files Set to Yes to configure Endpoint Protection to scan for malware in archive files (like .zip or .cab files) on computers. Scan email messages Set to Yes to configure Endpoint Protection to scan incoming email messages when they arrive on computers. Scan files opened from network shared folders Set to Yes to configure Endpoint Protection to scan files that are opened from shared folders on the network. These are typically files that are accessed by using a Universal Naming Convention (UNC) path. Enabling this feature can cause problems for users who have read-only access because they cannot remove malware. Scan mapped network drives Set to Yes to configure Endpoint Protection to scan files on mapped network drives. Enabling this feature can cause problems for users who have read-only access because they cannot remove malware. Scan removable drives Set to Yes to configure Endpoint Protection to scan for malware and unwanted software on removable drives, like USB flash drives, when you run a full scan on computers. Limit CPU usage during a scan Set the maximum percentage of CPU usage that can be used during scheduled scans on computers. You can set this value from 1 to 100 percent. The setting Choose how Endpoint Protection acts on malware of the following alert levels specifies the default action that Endpoint Protection takes when malware of various alert levels is detected. For each alert level, you can remove the malware, quarantine it, or take Microsoft’s recommended action. Recommended value: Recommended action, which enables Endpoint Protection to recommend action. The setting Files and folders to exclude when running a scan or using real-time protection excludes specific files or folders when a scan is run or when real-time protection is used on computers. The setting Processes to exclude when running a scan or using real-time protection lets you exclude specific processes when a scan is run or when real-time protection is used on computers. You can exclude only files with the following extensions: .exe, .com, or .scr. The setting File extensions to exclude when running a scan or using real-time protection lets you exclude specific file name extensions when a scan is run or when real-time protection is used on computers. Basic - Sends basic information to Microsoft about detected malware. This includes where the software came from, the actions that you apply or that Endpoint Protection applies automatically, and whether the actions were successful. Advanced - Sends more information to Microsoft about malware, spyware, and potentially unwanted software. This includes information about the location of the software, file names, how the software operates, and how it has affected your computer. You can also Receive dynamic definitions based on Microsoft Active Protection Service reports. Intune console - From the Groups workspace, select the computers that you want to update. Choose Remote Tasks > Update Malware Definitions. Managed computer - Start the Endpoint Protection client software from the Windows notification area. Choose the Update tab, and then choose Update. Intune console - From the Groups workspace, select the computers that you want to scan. Choose Run a Full Malware Scan or Run a Quick Malware Scan. Managed computer - Start the Endpoint Protection client software from the Windows notification area. Select Quick, Full, or Custom, and then choose Scan now. You can view the status of a remote task by choosing the Remote Tasks link in the bottom right corner of the Intune console. The Remote Task Status dialog box lists current remote tasks, task status, device name, and any reported errors. It also provides a link to troubleshooting information, if appropriate. Malware instances that need follow-up – Click the link to see a list of malware issues, including the follow-up action that needs to be taken to resolve the issue. You can further explore this list to see which computers are affected. Computers with malware that need follow-up – Click the link to see all computers with unresolved malware issues, as well as the follow-up action that needs to be taken to resolve the issue. Devices that are not protected – Click the link to see computers that are not protected by any endpoint protection software, either because no software is installed, or because there is an error. Select a computer to view more details. Devices with another endpoint protection application running – Click the link to see computers that are running a third-party endpoint protection application. View Properties – Opens a page with more information about the selected malware. 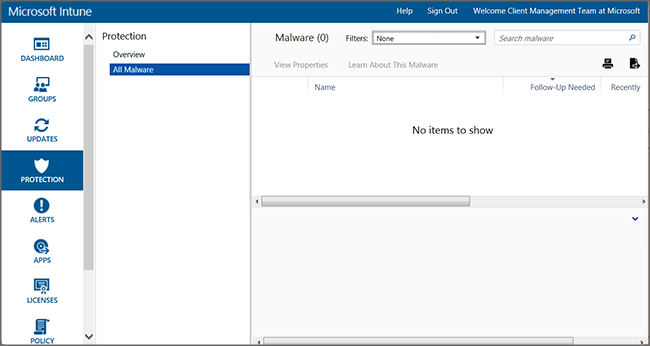 Learn About This Malware – Opens a topic from the Microsoft Malware Protection Center with more information about the malware. The Protection workspace is not displayed in the administration console until you have installed the client and are managing at least one computer client. In the Microsoft Intune administration console, choose Groups > All Devices > All Computers. Right-click the computer whose recent detection paths you want to see and select Properties. Select Malware from the tabs across the top. Right-click the column header. A list of available columns appears. Select the Recent Detection Paths check box in the list. 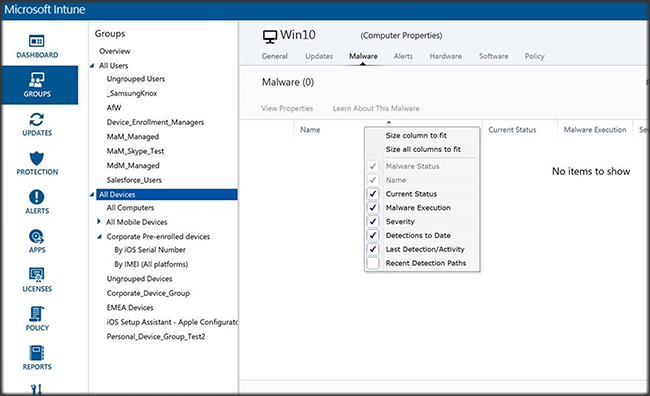 The Recent Detection Paths column appears and displays up to 10 of the most recently monitored malware instances on the device. Intune can run either a full or quick malware scan by using Endpoint Protection or Windows Defender on a remotely managed PC that has the Intune client installed. In the Microsoft Intune administration console, go to Groups > Overview > All Devices > All Computers, and then select the computer that you want to target. Choose the Remote Tasks drop-down list, and then select the task to run on the remote computer. For further help and support, see Troubleshoot Endpoint Protection in Microsoft Intune.